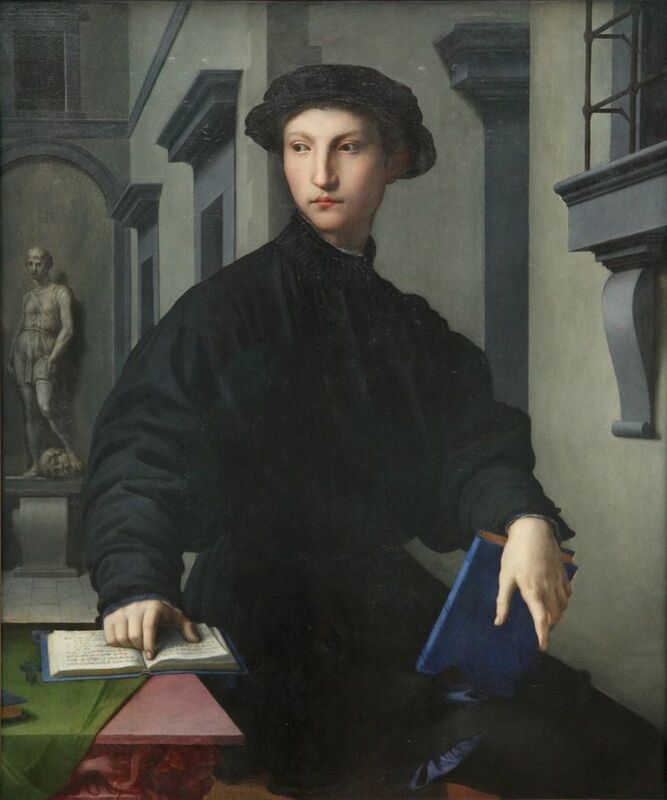 Owing his nickname to his red hair or dark skin, Bronzino is famous for his portraits in icy cold tones. 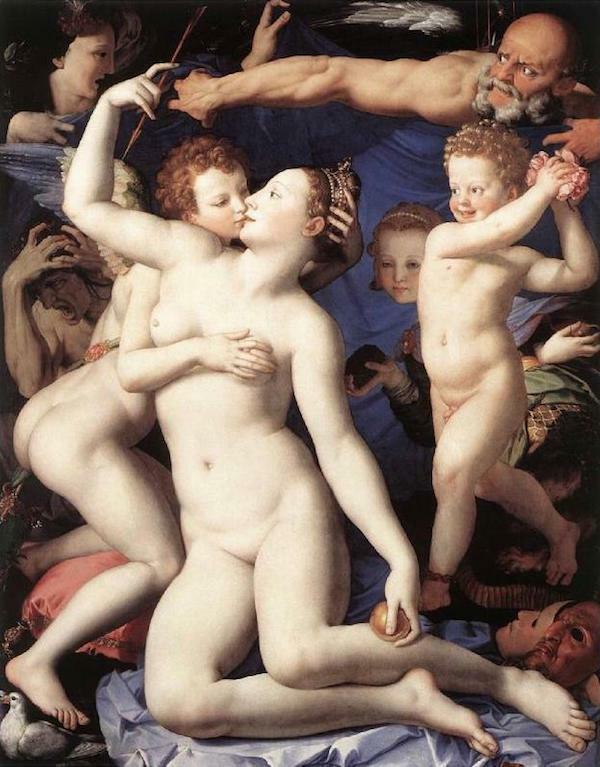 Born in 1503 in Florence, Bronzino quickly drew attention for his painting talent. At the age of 14, he joined the studio of Jacopo da Pontormo, the greatest Florentine artist at the time. The two artists soon began collaborating on numerous projects. Bronzino’s hand is often recognized in the decoration of the Capponi Chapel (Santa Felicita, Florence). But as his style was very close to Pontormo’s, it is difficult to make any conclusive attributions. Indeed, both artists were eminent representatives of Mannerism, in vogue in Italy at the time. A style also adopted by Vasari, Parmigianino and Rosso Fiorentino. What these painters had in common was one ultimate reference: Michelangelo. They took the view that the Sistine Chapel’s terribilità – or ability to provoke awe – was a manifesto for modern painting, and it was soon adapted for princely purposes. Bronzino’s time came in 1540 when his services were requested by Cosimo I de’ Medici, Florence’s iron-fisted ruler since 1537. The first project to be entrusted to the artist was the decoration of the chapel of Eleonora of Toledo, the wife of Cosimo I (Palazzo Vecchio). 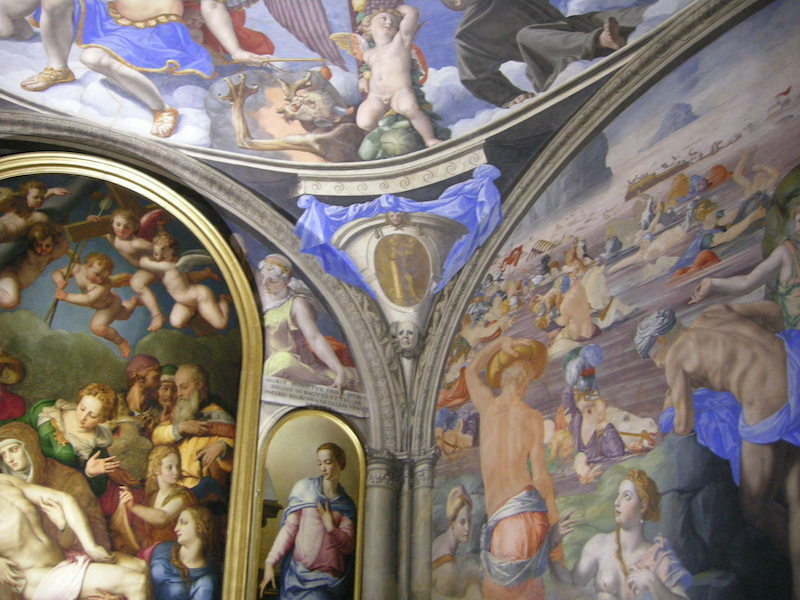 On one of the walls is the Deposition of Christ, inspired by Pontormo’s work in Santa Felicita. Paintings all around retrace the story of Moses, and here Michelangelo’s influence leaps to the eye. As a whole, the chapel’s decoration celebrates the Medici’s wielding of power in Florence, the dynasty having returned to favor after a troubled patch. The series of tapestries representing The Story of Joseph (c.1550) follows the same lines as it can be seen as an allegory on ‘good government’. Indeed, Florence’s tapestry manufactory, founded by Cosimo I in 1543, was an ideal instrument for propaganda. Yet the area in which Bronzino’s talent shines the brightest is portrait painting. The many effigies he created to represent Medici family members are absolute gems in this genre. 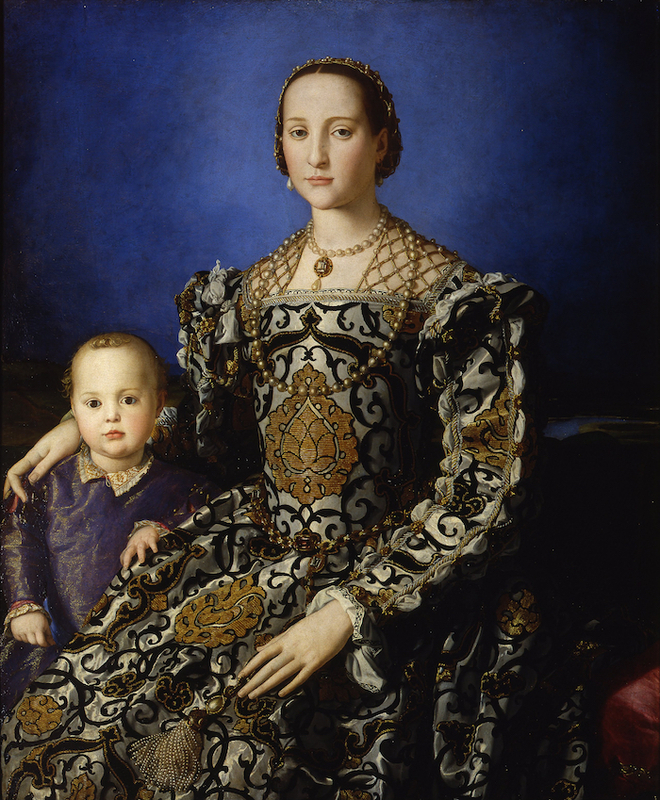 One after the other, Bronzino painted Cosimo I, his wife and his daughter, with unparalleled ingenuity. The exceptional Portrait of Eleonora of Toledo (1545, visible at the Uffizi Gallery in Florence) exemplifies the style leading to his works’ renown: an icy tone created by the contrast between bright colors and the models’ cadaverous appearance. The rigidity of the bodies and faces, painted like death masks, plunges the painting in weighty silence and stirs meditation. The overall effect is powerfully magnetic. 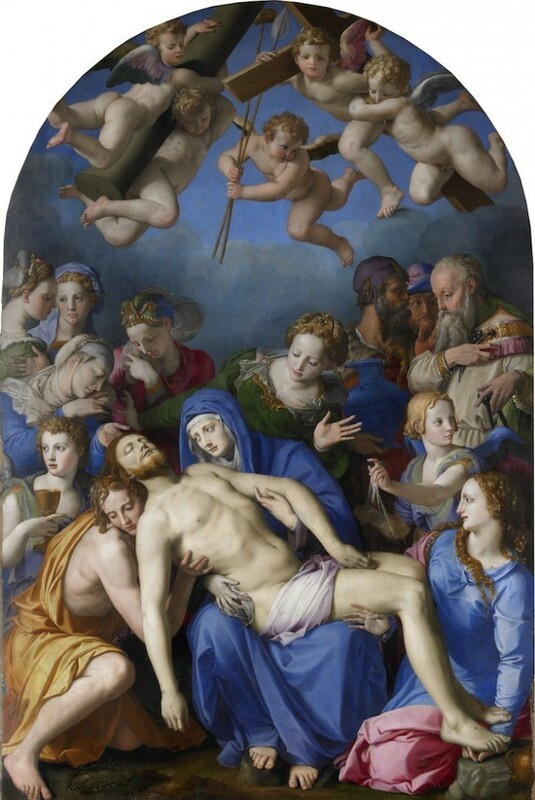 The unique style of Bronzino’s works reveals his meticulous study of bodies – we can assume that the artist attended a few autopsy sessions. But he also unveils an interest in the psychology of his models. Pointing to the tight union between the inner soul and the outer envelope, his works become memento mori, prompting reflection on mortality. Bronzino’s portraits also celebrated the prestige of Florentine courtly etiquette. According to Balthazar Castiglione’s book dating from 1528, the ideal courtier had to show virtue and erudition. Bronzino was no exception to the rule. He wrote poems and was an active participant in courtly life. In 1563, he helped to establish the Accademia delle Arti del Disegno, a drawing academy founded by Cosimo I. His many portraits were copied at the prince’s request, to be used as diplomatic gifts. Bronzino also took on commissions, such as Venus, Cupid, Folly and Time (c.1545, displayed at the National Gallery, London). This work, verging on decadent, was intended as a gift for France’s François I. An allegorical enigma in keeping with the fashion of erudition at the time, the work once again revealed Bronzino’s penchant for cadaver-like models. Venus at the work’s center engages in a figura serpentinata that brings to mind the contortions of Michelangelo’s figures. At the same time, Bronzino also painted portraits of many court figures such as Ugolino Martelli, Laura Battiferri and the Panciatichi couple. In these works, the influence of Bellini is clearly distinguished. Overlooked in the 19th century, Bronzino has recently returned to grace in the eyes of the public. 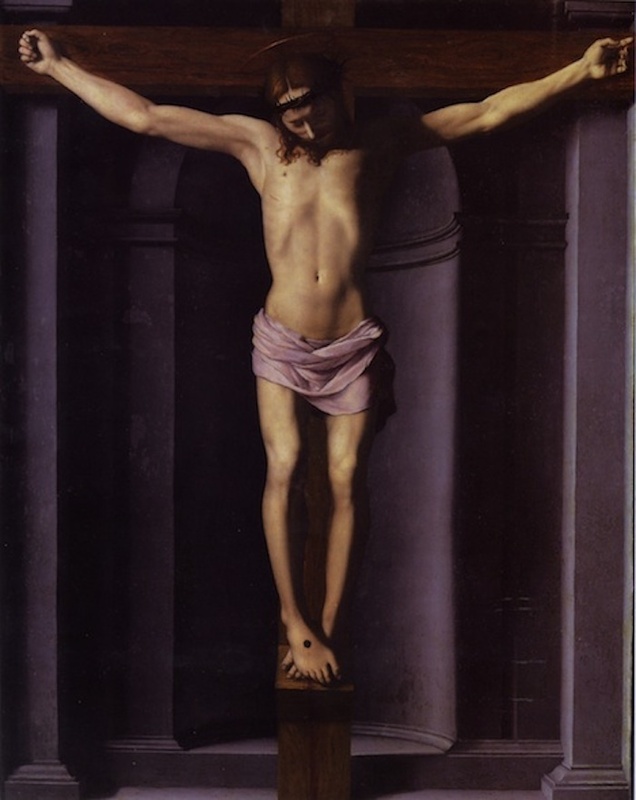 The rediscovery of his Christ on the Cross in 2010 (c. 1545, shown at the Musée des Beaux-arts de Nice) proves that the artist was also a religious painter – further attested by his Deposition at the Musée de Besançon. Bronzino died in Florence in 1572 at the age of 69. But his art lives on, as relevant as ever. It features regularly in major exhibitions, as was the case in 2010 in his hometown of Florence.